Day 007 | Does My Homeowners Insurance Cover Personal Liability? You’re outside with your dog Scout. Scout’s a fine pup. He’s never shown any signs of aggressive behavior. The 5-year-old boy who lives up the street from you wonders down and starts playing with your dog. The boy unknowingly provokes Scout. Scout reacts by biting the boy on his hand. The boy is rushed to the emergency room and requires stitches, as well as plastic surgery to repair the damage to his hand. The boy’s parents file a claim against your homeowners insurance policy claiming you were negligent in the supervision of your dog and seek $70,000 in compensatory damages. Homeowners Insurance = So much more than protecting the structure of your home. If you’re accused of causing injury or property damage to a third-party and now faced with a lawsuit, your homeowners policy offers protection. Should you be found at-fault you may be responsible for their medical bills, pain and suffering, and/or lost wages. Your policy will also pay your legal defense costs. Does My Homeowners Insurance Cover Personal Liability? Your homeowners insurance comes with Personal Liability, which protects you and your immediate family if you’re found negligent for causing injury or property damage to a third-party (i.e. someone outside of your home). The policy will pay for someone else’s damages and the cost to defend you. The beauty is, coverage goes beyond the four walls of your home. It follows you anywhere in the world. Traditionally coverage limits start at $100,000. Medical bills and defense costs can eat into that pretty quick. If you don’t carry adequate coverage limits, you risk selling your home to pay a court judgment. Increasing your Personal Liability limits of coverage is inexpensive. Talk with your agent, you may have different needs than the next person. Every situation is different. Looking for more? 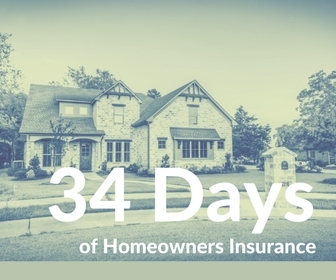 34 Days of Homeowners Insurance is right here.